It is fantastic to have lived up to all your expectations. Thank you very much for recommending the work of our team. We are in Plaza España, at the center of everything! Quality Department of VP Hotels. The price you found is 11% lower than this hotel's average rate of $324/night. From the time you enter the hotel until you leave this place is beyond expectations. 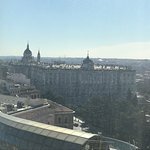 Clean, new, automated and very modern hotel in the heart of Madrid. Very convenient location. Very helpful, pleasant and welcoming staff. Service is very prompt. Breakfast buffet had great variety and options to order as well. Superb customer service !!!! Will highly recommend this hotel and if I were to return to Madrid will stay here again. It is fantastic to have exceeded all your expectations. Thank you very much for your comment, we hope you will repeat your experience very soon. We liked the hotel the staff excellent the location very good and near from the tourist area and restaurants the hotel is clean and quick response when we need anything I will recommend it for my family and friends. Thank you for recommending us. We await you at our hotel five stars! Excellent hotel and location. Bedroom and bathroom top notch. Tricky to swim in pool as knees touched bottom. Wouldn’t recommend visit to Ginkgo restaurant. We were there for 5 days, the brakfest was very nice but a little bit expansive, the rooms are new and clean and the beds are comfy. An authentic 5 star experience! Thank you. Had a wonderful getaway to Madrid. The hotel was wonderful. It’s in a great location, just a short walk from the palace. Most attractions are within a 15-20 minute walk from the hotel. The rooms are spacious and clean with modern amenities and have super comfortable beds. We arrived early morning, and check in was a breeze. We upgraded and had a beautiful view of the city, including the palace, from the wall of windows in our room. The staff is very friendly and accommodating. Puri at the guest experienance desk was quite helpful in arranging dinner reservations and show tickets. We had a very luxurious hotel stay at an economical price. We will definitely be coming back! It is always a pleasure to offer you everything we can to turn your stay into unforgettable days. We see you on your next holidays!